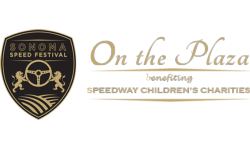 Speedway Children’s Charities (SCC), the charitable arm of Sonoma Raceway, will host Sonoma Speed Festival On the Plaza to kick off the inaugural Sonoma Speed Festival weekend of vintage racing at Sonoma Raceway. Sonoma Speed Festival On the Plaza features some of the best Sonoma Valley wines and cuisine alongside a display local vintage cars for a one-of-a-kind evening on the Sonoma Plaza. The collection of historic race cars and local vintage cars will cruise from the Sonoma Speed Festival to the Sonoma Plaza.